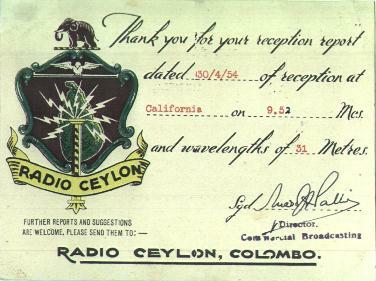 QSL card from Radio Ceylon for report on 30 April 1954 on 9.520 mHz. Power was 7500 watts. This QSL was from the Commercial Service of Radio Ceylon on 9.520 mHz. This station carried many commercial programs ( which was a rarity in those years) and was a regular on the west coast of the U.S.A. Ceylon was then a British colony and is now independent with the name Shri Lanka (was Sri Lanka).